Actually, this is the same Tilt Box you've known and loved, with a just few upgrades to make it even more useful. 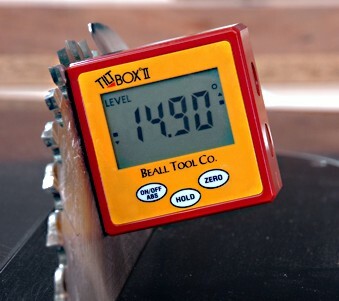 Tilt Box II still snaps to your saw blade, jointer fence, band saw or even telescope with powerful magnets so that you can read relative angles directly without relying on the often unreliable readings from the tool's own pointer. The display remains right-side-up even when you turn the unit over, so that you don't have to crank your neck into untenable positions in order to read it. As a bonus, it is also factory calibrated to read absolute angles so that you can use it as a portable pocket level. It will automatically turn itself off if left on for more than ten minutes. It remains an invaluable tool for anyone constructing polygons or doing any sort of segmented turning, not to mention aligning wheels or telescopes Now manufactured with a new chip, Tilt Box II has a "Hold" button so you can keep your original measurement without having to rely on your memory. In addition, it sports magnets on its bottom as well as both sides to allow you more options for placement. To use the Tilt Box II, simply turn it on; place it on your saw (or other) table and press "Zero" to establish relative zero. Then attach it to your blade, fence (or any ferrous surface) by means of the rare earth magnets on its sides or bottom: It will register the relative angle between the blade & the table on a large, easily read display. Since the Tilt Box II can be zeroed at any angle, your machine table need not be level to obtain the relative angle between the table & the blade. The Tilt Box II has a die-cast metal body and is powered by a 9 volt battery - which is included along with a small Phillips screwdriver for removing the back. Complete instructions for its use are enclosed. Note About Accuracy: The original Tilt Box was advertised as having a resolution of .05 and an accuracy of .1. While this was (and remains) true of many of the units, it is not, we have discovered with time, true of all of them, and so, for the sake of accuracy, we are now downgrading our claims to the more realistic .2 of a degree.